Shape your discounts with clever conditions. Create promotions based on customers' info and purchase history. Use 20 actions to be sure that your promotions are unique and relevant. Build a clever discount system instead of conducting occasional special offers. Analyze your stock and create cart price rules that help you sell, don't forget to take customers' info into account. Effectively manage your company selling strategy by disabling promotions for products with Magento 2 special price. Thanks to thought-out conditions functionality you can create highly individual and accurate promotions. Such a personal approach makes customers feel cared about and they pay back with loyalty. Let customers understand that shopping at your store is beneficial. Create promotions for various occasions, give small prizes and customers will not resist coming back. Buy a sneakers and shoelaces will be for free. This group of actions includes promotions connected with two different products - users buy one and get another one discounted. Spend $300 and get a $40 discount. These actions are good for products, which are usually bought in several pieces. You can set which of the pieces will be discounted and apply discounts either to all products in the cart or to the same products only. Create promotions to sell more pieces of the same product - set a percent or a flat discount. Create product sets according to your needs and set fixed or percent discounts for them. Give discounts on additional products which you want to sell with . After you buy 5 T-shirts, each new one will be with 50% discount. Choose whether to show banners for all products, product categories or separate items. Combine different banners: show the top banner and after a product description banner at the same time. Add labels to the necessary products. Use them as a separate tool or show together with banners. Specify customer's attributes and apply more personalized discounts. For example, you can give discounts on St. Patrick's Day to all people, who have 'Green' in their last names. Or create a peculiar loyalty bonus for clients with a Membership period more than 365 days. Set promotions based on orders qty and total amount spent to reward loyal customers and show that you value them. For example, create deals for customers who placed 4 orders and/or spent $500 for the last 6 months. Create custom options for products and use them as rule conditions. This is a very accurate way to limit promotions, you can adjust the offer to any case. E.g. : you offer glasses, and there's a custom option to include an engraving. In this case you can offer discounts only on engraved glasses. Specify order statuses (pending, completed, etc.) and time after orders were placed to restrict rule use. For example, you can apply the rule only for customers with 3 or more orders, with order status "Complete" and which were placed 6 months or less ago. Clearly indicate a discount amount on the cart page. Let customers know that they are using special offers. The module supports multi store and multi currency options at the general configuration level and also fully integrates with Magento taxes functionality. Complete various actions by means of web services, which interact with the Magento system via Magento API. Editing prices for all products manually is a 'monkey job'. It's also pointless to give discounts for products in Magento 2 on special price as it's not profitable. Now you can enable 'Skip products on special price' option and save your time. Define which price should be selected for discount calculation for every rule in Magento 2. Choose one of 3 options - the special price, the original price or the price after previous discounts. Apply our Magento 2 Automatic Related Products extension to maximize profit by offering product bundle packs. Show customized bundles and increase spontaneous purchases. By default, the Enterprise Edition for M2 has a rich Segmentation functionality which already includes condiotions based on Customer attributes and Order history. Therefore, we didn't add these conditions to the Enterprise edition of the module. I want to say that for me it was hard to install but Amasty tech group did it from a to z. One thing could be better though, when you set promotions the info about it is like a small line above the cart screen. Some customers even don’t find it and then complain that I trick them. Would be nice to have this information in another way big and bright so no one misses it. Actually, we started with another module, free gift. We wanted to give a gift when customer ordered min 100 items. Yet there was an error, and only changes in magento core could help. Amasty offered special promotions as an alternative. I don’t regret the switch. Special promotions is a stronger module that will do in my case as well. I just use catchy banners and promo items. Also, there are many other promo features. I wasn’t actually looking for them, but now they affect sales well. Recommended extension, really. A very practical extension for an online store. I heavily use promotions. I try different rule conditions to find those that pay off better. I had some questions regarding compatibility, and they answered very fast. No cons for now. A real masterpiece by Amasty - eventually, I have it on Magento 2. Works as described, smoothly and without conflicts. 22 ready-made flexible promotions and dozens of conditions to please and engage buyers. – Improvement: the fields order and the text prompts are changed to simplify the cart price rules settings. 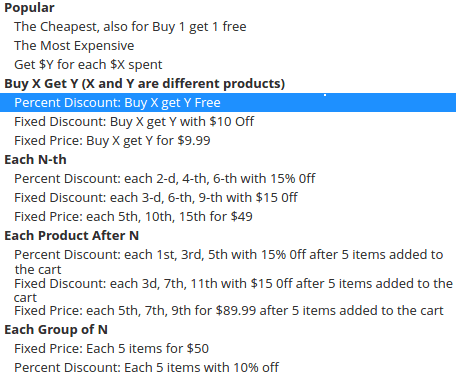 – Improvement: 'Calculate Discount Based On' setting was removed from 'Each N-th', 'Buy X Get Y' and 'Each Product After N' actions as non-applicable. – The discount calculation for the "Each Nth" rules was fixed. – The installation script was fixed. The promo actions "Each M-th After X-th" and "All Product after N" were combined in one action - "Each Product After N". The promo actions "Buy X get N of Y" and "Buy X get Y" were combined in one action - "Buy X get Y". 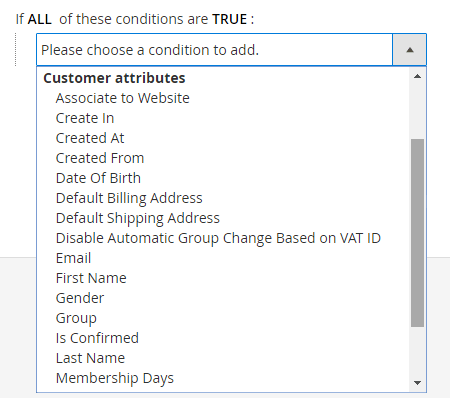 – The advanced conditions display on Magento Enterprise Edition was changed. – The issue with promo rule labels display was fixed.